Born in El Khnansa, Morocco in 1974, Latifa Echakhch has lived most of her life in France and now resides and works in both Paris and Martigny, Switzerland. Echakhch’s work focuses primarily on themes of cultural identity, agency, globalization, and immigration. Her 2006 work, Hospitality, explores the bureaucratic obstacles faced by immigrants to France and the ways in which these “outsiders” are perceived by their Western counterparts. In the fall of 2008, I had the opportunity to view Echakhch’s installation, Speaker’s Corner, on display in London’s Tate Modern. 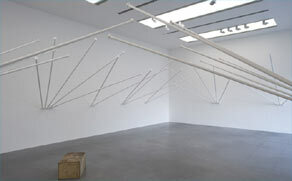 The installation is made up of two parts residing in separate rooms. Though physically separate, they relate to one another thematically on many levels. For Each Stencil Revolution 2007 is a room of dark blue carbon paper layered over the entirety of each of the four walls. The title of this section harkens back to international human rights and war protests of the 1960s, during which carbon paper was used to create multiple copies of flyers, statements, and images. To create variation in the shades and textures of the carbon paper, Echakhch dripped methylated spirit down the paper-covered walls. As a result, the blue pigment was leached from the carbon pages and formed small drips down the walls and onto the floor. 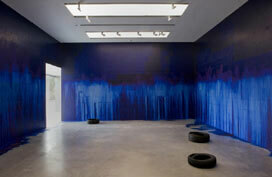 To this room Echakhch added a small installation piece, Smoke Ring 2008, comprised of burned tires. These are meant to symbolize the urban riots that occurred in the Parisian suburbs (and elsewhere in France) over the past two decades. Entering the first room of the installation and pausing to read the curator’s statement, I was overcome by the odor of the methylated spirits. My mind immediately went to my previous research on immigration in France, and I recalled former French President Jacque Chirac’s flagrantly racist comments regarding the “bruit et l’odeur” (“noise and odor”) of France’s immigrant population in the Parisian suburbs. According to Chirac, these intangible elements provided yet another division between the French and their “undesirable” immigrant population. Just as the strong odor of the methylated spirits created an intangible, invisible boundary between the room containing For Each Stencil A Revolution 2007 and the rest of the Tate Modern, there exists a similar, hazily- defined boundary for immigrants in France. These “invisible” boundaries exist for France’s immigrant population in general, but are especially significant to women who often experience multiple levels of marginalization by both the patriarchal structures of their cultures of origin and racist or sexist factions of Western society. Jen Westmoreland Bouchard is the owner of a freelance writing, editing and translation company, Lucidité Writing, LLC. She serves on the editorial board of The Journal of African Literature and Culture and has presented her research on Francophone women’s writing, postcolonial art and literatures and world language pedagogy throughout the United States and Europe. This entry was posted in Features and tagged art, feminism, immigration, latifa echakhch, race by revisionistslc. Bookmark the permalink.